Project Artist Louise White is looking to hire a Theatre Producer for her upcoming project Mother You. 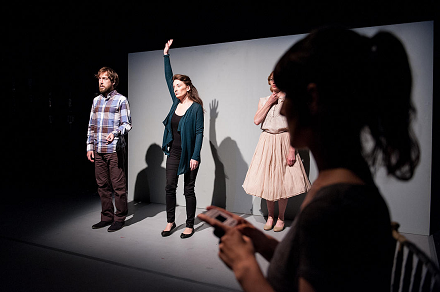 Mother You is commissioned by Project Arts Centre and as the Spirit of the Fringe Award by Tiger Dublin Fringe. It has been developed with the support of an Arts Council Creation Award and the Pan Pan International Mentorship Programme. It will premiere at Tiger Dublin Fringe in September 2015. Mother You is a large performance event for a disused commercial building in Dublin’s city centre. It will fuse installation, video art, role play games and ritual in order to create a bold theatrical event of fantasy, activism and communion. Louise is a Dublin-based theatre maker committed to developing collaborative, interdisciplinary performance. She presents innovative audience experiences in theatres and off-site venues. Since 2009, her practice has concentrated on social engagement with a particular interest in the empty buildings across the nation. Concepts of the public, community and socio-cultural environments are at the heart of her work. She has presented highly successful works as part of Tiger Dublin Fringe: Way Back Home (winner of Spirit of the Fringe Award 2013), From the Heart (nominated for Spirit of the Fringe, Best Off-Site Production, Production and Best Design 2010). Louise White is a Project Artist, Project Arts Centre’s artist support scheme and is offered financial management and account support as part of the scheme. The Producer will co-ordinate very closely with Project Arts Centre in relation to all financial matters. To find out more about this job opportunity, go to Louise’s website.